1) Klipsch has included an all new 1 ¾” titanium diaphragm compression driver with a new phase plug design to improve phase coherency at the throat of the horn, resulting in improved sound pressure linearity at high frequencies. 2) The redesigned 90° x 90° Tractrix horn utilizes a circular horn throat paired to a square horn mouth. This further enhances high-frequency response and extension. The compressed molded rubber construction adds high-frequency damping to reduce harshness and improve detail. 3) New dual chambered enclosure design, meaning the bifurcated enclosure allows each 10” woofer and port to work independently from the other. This improves the linearity of both drive systems, and minimizes standing wave problems inside the cabinet that can cause frequency anomalies in the sensitive midrange frequencies. 4) New Tractrix port utilizing Tractrix geometry, the new RF-7 III ports allow for the most efficient air transfer from the cabinet for the cleanest, most powerful low frequency response on the market. 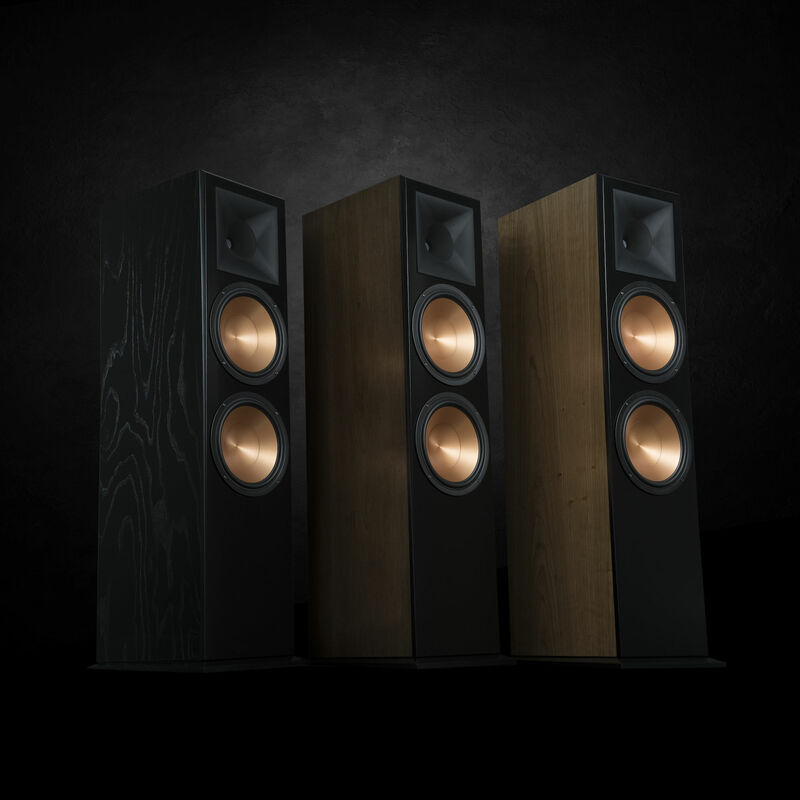 5) The modern design enhancements and upgraded materials used to build the Reference RF-7 III speaker reinforces its solid performance. Both speakers feature heavy-duty cast aluminum frame woofers that eliminate resonance. Cabinets are made from furniture-grade wood veneers and come in black ash, cherry or walnut. Magnetic grilles complement the premium design experience. 6) New slant riser base design enhances the overall appearance of the enclosure as well as provides a slight upward angle to better focus the sound on the listener. And finally, something so good it’s being handed down from RF-7 II to the RF-7 III, both series use a dual shorting ring magnet structure. Each 10” woofer features a large ceramic magnet structure with a dual shorting ring design to eliminate modulation of the magnetic flux resulting in improved linearity of cone movement. Kerry Geist, Klipsch Commercial and Consumer Product manager states, “The dual 10” woofers, coupled with a more linear motor structure, give the RF-7 III effortless low-frequency performance typically found in more expensive horn loaded low-frequency enclosures such as the Klipschorn.” Just when you think the sound could not get any better, Klipsch builds something even more sonically impressive! Check out the latest generation at a dealer near you.